After 12 grueling games, the World Championship is still undecided as reigning champion Magnus Carlsen offered a surprising draw to his opponent in a game where he had a significant (though not completely clear) advantage. Now, the two chess players are headed for tie-breakers — the last of which is called Armageddon. 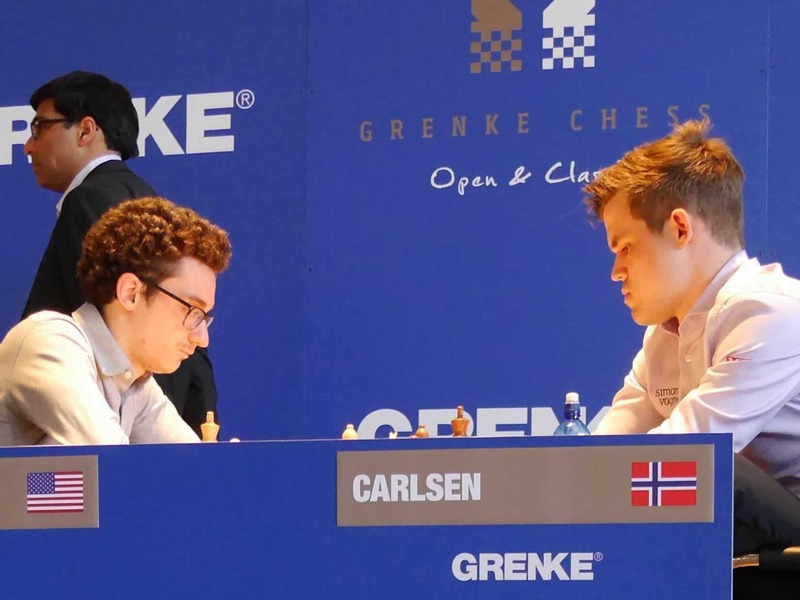 Carlsen (right) and Caruana (left) playing a previous game in Karlsruhe. If this was a football game (soccer, I mean), the 90 minutes would be officially over. Now, as we head to overtime, let’s recap what’s happened so far. The match was played between reigning world champion, Magnus Carlsen (Norway), who has been world champion since 2013, and Fabiano Caruana (US). Regarded by many experts as the best player to ever grace the game, Magnus seemed to be a level above everyone else. As the highest rated player in history, Carlsen has seemed untouchable for years. It’s not like he never loses — he’s had his fair share of unfortunate moments, such as when he missed a mate-in-3 opportunity against Anish Giri, or when he barely held on to his world title in 2016 against Sergey Karjakin. Yet no matter how battered and bruised, he was indisputedly the world’s best chess player. In 2018, however, things started to change. Some questioned whether his motivation was still in place. Others simply said his competitors improved. Former world champion Viswanathan Anand said Carlsen was a bit more “merciful”, not winning games which he used to be able to win. Whatever the case, in 2018, Carlsen no longer seemed like an alien or an unbeatable machine. The moody genius was showing some cracks in his armor. Although the margins are extremely small between the world’s leading chess players, there’s no better player to challenge Carlsen than Fabiano Caruana. Caruana is the first American to play for the World Chess Championship since Bobby Fischer in 1972. He is truly a complete player, being able to attack and defend equally well. He’s also an extremely hard worker, being known for his excellent preparation and deep calculating abilities. Much like Carlsen, Caruana is also a fighter — not afraid to struggle and defend even when the situation seems desperate. However, Caruana’s creativity and offensive capabilities are also fearsome, as he has shown in spades this year — by far the best of his career. Unlike most other sports, chess is typically played in an even number of games with players alternating between black and white pieces. This happens because playing with white is seen as a minor advantage, so there needs to be parity, and since chess games can end up in a draw, an odd number of games doesn’t guarantee someone would come out on top — which this match has clearly highlighted. Carlsen and Caruana agreed to play 12 games in London. Carlsen came out kicking, gaining an important advantage in the first game. 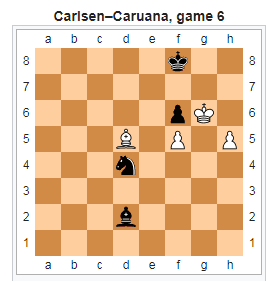 However, Caruana defended excellently, and Carlsen missed the opportunity to make a winning move. After that, games fell into a pattern where games were either stale and clearly drawn, or one of the two players had an advantage that was too small to guarantee a victory. It’s noteworthy that in game 6, Caruana had a major advantage, but a very peculiar position made him unable to deal the final blow. Funny enough, the computers managed to find a winning line for black (Caruana) here, but all chess experts agreed that no human could have been expected to discover that line. After 11 of the 12 games, the score was even, and only draws were on the scoreboard. As Carlsen himself stated, there was “too much at stake” to risk. Today, the last game of the match (before tie-breakers) was scheduled, and things were expected to get hot. It should be said that tie-breaks are essentially four extra games played in a much shorter time control — a format in which Carlsen is widely regarded as the favorite. So Caruana was expected to try and push for a win today, and to his credit, he did try. He opted for a very sharp position, which at one point seemed like it could go either way. But after a series of unconvincing moves, Carlsen found himself comfortably in the driving seat, seemingly pushing for a decisive win. However, much to the surprise of everyone involved, Carlsen quickly offered a draw, although he seemed to be better in the final position. First, 4 extra games will be played, with the clock starting at 25 minutes for each player, with an increment of 10 seconds per move; whoever is better after these 4 games wins. If the players are still drawn, an additional two games will be played, with a time control of 5 minutes plus 3 second increments after each move. If it’s still drawn, they play another two games. After all of this, if things are still level, there’s only one thing left to be done. The Armageddon tie-breaker format is pretty controversial, but it offers a way to make sure someone wins in a game which doesn’t naturally offer this possibility. It goes like this: the player with the white pieces shall receive 5 minutes, and the player with the black pieces shall receive 4 minutes. Whoever wins, wins — but because black has less time, he also wins if it’s a draw. There’s a lot of discussion about how fair this format is and, of course, no one really wants to get to this — but because modern chess has advanced so much (in large part thanks to help from computers), the winning margins between the world’s elite have become thinner and thinner, which means that draws are more and more common. Since even tiebreaks are not always conclusive, something like this was needed to break the equilibrium. The fact that this is even being considered — and that the prospects are already becoming more and more likely — suggests that, perhaps, chess is starting to undergo an identity crisis. Although it’s impossible to mathematically prove it (at least for now), it’s becoming clearer and clearer that a perfectly played game will end up in a draw. We can’t really talk about “solving” chess, but already, the realm of uncertainty has become much narrower than it used to be. So how, if at all, does chess plan to address this issue? While we know the problem of world champion will indeed get solved, the problem of draws could spell trouble for the long-term future of chess itself.